2014 Golden Halo Winner Charles Wesley prepares to welcome this year’s saintly champion. We embarked upon this Lent Madness journey over five weeks ago on “Ash Thursday.” With your help we have whittled the field of 32 saints down to two: Francis of Assisi and Brigid of Kildare. Who will win the coveted Golden Halo of Lent Madness 2015? Only 24 hours and your voting participation will reveal this holy mystery. Of course we literally couldn’t have done this without our stellar Celebrity Bloggers to whom we offer sincere gratitude: Amber Belldene, Laurie Brock, Megan Castellan, David Creech, Laura Darling, Neva Rae Fox, Nancy Frausto, Robert Hendrickson, Maria Kane, and David Sibley. Thanks to Bracket Czar Adam Thomas for his stellar behind-the-scenes work in keeping the bracket updated daily — in his inimitable style. And to our Resident Foodie, Maria Nolletti Ross, whose recipes in the Saintly Scorecard quite literally helped spice things up. You all rock! And we’re all grateful for your good writing, good humor, and adhering to most, if not all, of the SEC-imposed deadlines. Finally, thanks to all of you who participated by voting, commenting, drinking coffee out of Lent Madness mugs, filling out brackets, talking about saints at coffee hour, liking us on Facebook or following us on Twitter, and allowing us to play a small role in your Lenten journey. We’ve loved having each one of you along for the “madness” and on behalf of the Supreme Executive Committee we wish you a blessed Holy Week and a joyous Easter. But enough gratitude. We have a Golden Halo to award! As with all the matchups, the polls will be open for 24 hours and the winner will be announced right here at 8:00 am Eastern Time on Maundy Thursday. At this point, everything about these two worthy saints has been said (though if you need some refreshers, click on the Bracket tab). We have simply asked our two remaining celebrity bloggers, Laurie Brock (Francis) and Megan Castellan (Brigid) to provide us with one image and one quote. Lord God, living and true. I would like full vessels of charity. I would like rich treasures of mercy. I would like the friends of Heaven to be gathered around us from all parts. UPDATE: The Supreme Executive Committee is serious about one person, one vote. We have discovered some cheating, that is, people who are voting multiple times from one location. As many as 121 votes have been cast from one place. To keep the race fair, we are removing 201 votes from Brigid, and 46 votes are under suspicion. The excessive voting was from Santa Clara, CA; Washington, DC; Lawrenceville, GA; Baltimore, MD; and Fort Washington, MD. If we discover that some of these votes were legitimate we will re-add the votes to the total. For now, expect the total number of votes for Brigid to decrease around 6:45 p.m. EST. If you want your saint to win, get others to vote. Do not cast several votes yourself! 387 Comments to "For the Golden Halo: Francis of Assisi vs. Brigid of Kildare"
It’s going to be a close one. I will be happy either way; however, if Brigid wins, I’ll order a mug. a Bridid mug for me, too! I was born on St. Francis day. Need I say more? It would be awesome to have a mug with St. Francis on it! I bet he would use it too ! ! ! Great idea, but can you send a mug to a URL? @Chris .. sorry if it’s confusing .. I wanted to indicate where I found the address that I posted. I saw a few variations on the web and before someone said it was wrong, offer the source, not just a postal address. Discovering the U.S. has an embassy to the Holy See gives me some confidence they would know correctly how to get mail to His Holiness. He’s the first pope I’ve ever seen worthy of the title. Besides, he seems to have a good sense of humor ! I went to school at St Brigid’s…. Need I say more?????? St. Francis is a perfect role model, and he’s a great ecology saint. Since all of my picks have gone down a while ago I guess I’m stuck with Francis. Me, too! Erin go Brigid! Me too! She’s my patroness, I wear her cross! Go Brigid! A mug for me too if Brigid wins!! Same here for me. Go Brigid! I am delighted with the final matchup between St. Francis and Brigid! Either way, I win! They have been my faves all along. I do now pray to Dorcas, however; For suffering a name like that puts her at the top of my list of holy people. Thank you to the SEC for a fun and information filled Lenten experience. You have another devoted player in your Lenten Madness! Nature versus beer….hmmmm….not really that simple, but I’m going with Brigid. And a new mug sounds good to me! Oliver didn’t want to do this but he has to pull in his UK/EU influences for this vote. We are going international and have until 8 am EST. I voted for brigid because she makes a good grilled cheese sandwich and perfect milk. And that is an excellent reason, Oliver. Thanks for your comments throughout this journey! Oliver for the Golden Halo! Sounds like someone voted when he was hungry! But made a good choice anyway. You and your family have a blessed Easter, Oliver! Another Irishman for Brigid! I’ll get a mug if she can mount a comeback and wins, and I don’t even drink coffee! thank you,Oliver, for your wisdom throughout this contest. I think I missed the good qualities you named for Brigid. Her collect is perfect. That is what I would like too. AND a grilled cheese sandwich and a glass of milk. Blessings. Now I’ll think of Brigid every time I eat a grilled cheese sandwich! Can’t wait to read your comments next year, Oliver! Have a great year! St. Francis is my man! He has my vote for the golden halo! Thanks to Lenten Madness I enjoyed participating & learned a lot about the saints! Me too. Thank you one and all! Brigid of Kildare! Francis is already so popular and famous, let’s show some respect for a woman who did just as amazing things! I agree Elliott, it is time for Brigid! thank you Lent Madness! Amen! Amen! I will order the Brigid mug. that is how I finally decided, as well. A match up of two saints I’ve been pulling for all along. How will I ever decide? Perhaps I’ll wait to hear from Oliver. Personally, I was pulling for a Brendan vs. Brigid final, but half of it came true! that would have been more cruel than this match-up. Oh, no doubt! I have absolutely no idea who I’d vote for. me neither — throw the dart for that one — unless another of those wonderful prayers got pulled out of the ether. Exactly. The prayers were especially good today, weren’t they? Thank you, Laurie and Megan! I cast my vote for Francis in honor of my daughter whose high school pilgrimage was to Assisi, and for my other daughter who is a champion for the downtrodden and for all the fur I share my life with who show me what unconditional love is. Amen! I, too, am awash in four-legged fur at my house! God bless St. Francis, I’ve always blamed him for my inability to say “no” to any living creature that needs a home! May God continue to bless all of you who made this amazing Lenten devotional possible! Yes indeed — as someone recently returned to the fold, so to speak, I have learned a great deal about the saints, some of whom I’d never even heard of, and enjoyed a lot of laughs along the way. Thanks for helping us all to keep a holy Lent! Brigid has already won the Golden Halo in my heart, even in the light of my appreciation of Francis on the likes of Richard Rohr and the Pope. Thanks SEC and bloggers for a witty and wise Lent Madness. Francis already has a pope, and lots of recognition. By bringing Brigid beatifically forward, we expand our knowledge of yet another saint. I say give (another) Halo to Brigid; more prayers to Francis. And thanks indeed to the Celebrity Bloggers, who brought all 32 saints more fully into our lives. Thanks, Oliver! I’m voting for grilled cheese today, too! Martin and 12-yr-old Megan, what say you? As much as I love all things Celtic, I had to put my vote where I am reminded of my sweetie that has gone over the Rainbow Bridge and a Pope who has offered some terrific unstuffy actions over the last two years. This Pope gives me hope that the Holy Catholic Church can evolve! Hurray for both Franicises! I’m with you and Oliver!! Brigid for the win! I’m sure Brigid and Bacchus would lift a companionable mug together if they ever meet. Hard to decide this time! But I knew it would come to this. Voted for Brigid because the only United Methodist monastery I know of is St. Brigid’s – since last year’s Golden Halo went to a man…..
if it’s Bridgid, (my choice) I hope it’s s beer mug! That was brought up in a discussion at our church yesterday too! Will be happy no matter the winner – a good outcome. Megan’s offering for Brigid today tipped the balance for me as it called to mind the ‘communion of Saints’…’the mighty cloud of witnesses” . Megan, what is the source? For Brigid, who was born a slave, gave away all she could to those who were even more needy, freed her mother from slavery, became an abbess, and continued to provide for all around her with spiritual guidance, cheese and milk and, yes, beer. St. Francis will live forever in our lives and actions – let’s bring Brigid forward, too! You stated that beautifully, Vicky. I couldn’t agree more! I’ve got to go with Brigid. She was a model of a Christian woman at a time when women’s voices were not often heard. She didn’t bow to the demands of society, she did what God called her to do. Love her!! Need a coffee mug. I am nervous…very nervous. In the end, it doesn’t really matter who wins, my spiritual life is richer because of all I have learned during the 2015 Lent Madness. St. Francis will continue to guide and inspire me throughout my mortal life and that’s what counts to me. He already has his golden halo. Heh. Make that two votes *for* “Lent Madness”! Love it. Noooooooooooo!!! What to do, what to do? WWOD???? Oh, he voted for Brigid. OK me too. I was all set to cast my vote for Francis. Then I read Brigid’s prayer and it resonated with me even more than the beautiful prayer of St. Francis. I guess the feminist in me was grabbed especially by the image of “the three Marys of illustrious renown.” Like Brigid, I would like the angels to be among us, cheerfulness to preside over us, and all the friends from Heaven to be gathered around us. This is a tight race, both Saints are already crowned in glory. But I hope by the end of the day Brigid will receive the coveted Golden Halo! I am firmly in the Francis camp, but then I read Brigid’s quote and was sideswiped by the word “Cheerfulness!” Wouldn’t it be a wonderful world if we could all be a bit more cheerful? Brigid gets my cheery vote! Lovely to hear you play the hammered dulcimer, Karen! As a church staff member in the throes of Holy Week preparation I resent that such a close race that will require my constant monitoring, thus preventing me from getting anything done today! Spare a stressed-out church-working Francis fan and VOTE FRANCIS! Woohoo! Thank you to all the unsung church staff who spend so many hours coordinating the details of Holy Week: the stacks of bulletins, the website updates, the flower deliveries, the information for the welcome tables, ordering extra photocopier paper, reminding the sexton that the timer for the sanctuary lights needs to be deactivated because of the evening services, answering all the phone calls asking what time services are on Easter…Tracy Stapp of St. Stephen’s, this is for you and for all the other office managers at all the churches of every denomination dealing with the busiest week of the year. Well my son is a brew master and his patron Saint is Brigid so there you are, I do like animals also and St. Francis is in our garden so I may as well have Brigid in my cupboard. Thanks for a delightful Lenten exercise. I forgot to thank the Supreme Executive Committee for a job well done. I cannot imagine all the effort and time it took for the SEC and the Bloggers to make this possible. Thank you very much for all your hard work. See you in 2016! In the beginning I was rooting for 3-4 saints and now 2 of them made the final two. I am torn. I could vote for either one. But in the end my Celtic roots got me to go for St Bridget. If you have ever been to her cathedral in Kildare, and read her stories and works there is something special with her that got me to say she is the one to get the Gokden Halo in 2015. St. Francis is one my most favorites too. St. Francis – for today’s beautiful prayer as well as his life and works. So far, closer than I thought it would be. Figured Francis would be a shoo-in. Go, Team Brigid! Get out the vote. it seems like it went by so quickly this year. i am beginning to get LMW. thanks to the SEC and the bloggers. GEAUX Francis…. I am thinking Brigid is probably the underdog so voting for her. Megan is my Priest. My husband is Irish. Need I say more? I must admit my Celtic roots called me to vote for Brigid as did her prayer. 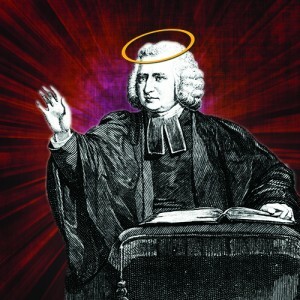 I was also very pleased to see Charles Wesley waiting with his halo to greet this year’s winner. Yes, I would like a Brigid mug. She has received my vote. Either way, we are all winners. Thanks to everyone who planned and participated in this year’s Lent Madness. It is always great fun to be reminded of our heritage and share thoughts, witty and wise, with fellow pilgrims. Blessed Easter to all. “I would” like Brigid to win the Golden Halo. And, I’m with Patsy- if Brigid wins I’m ordering the mug. Thank you all Lent Madness contributors, humorists, celebrities and leaders. What a gift you’ve given. Two powerful constituencies: pet owners versus Irish. A life of charity and leadership vs stigmata and a pope. But I like Brigid’s guest list. I would pray to be even a bus boy at that party. If Brigid wins, might we consider the first ever Golden Halo pint glass? Home brewers would buy them like crazy! Brilliant idea!! I’d love a St. Brigid pint glass. Even though I voted for Francis (after much gnashing of teeth), I’ll be thrilled if Brigid wins. I had the same thought! Francis may have been one you’d want to have a mug of coffee with. Brigid is one I’d like to hoist a pint with, in a glass with a Golden Halo on it! I’m in for a pint glass…win or lose. What a terrific matchup. I have a son with Francis as his Confirmation name and a daughter with Brigid. I have dual citizenship with Ireland which make me lean towards Brigid but the 125# St. Bernard named Guinness sitting by my feet is sending nonverbal suggestions for Francis. Sorry Oliver, I’m voting for Francis but my sister will wipe out my vote with one for the girls. Thanks to the SEC for a terrific, nail biting LM season. A pint glass would be a fine gift for the beer drinkers amongst us. Ooooooh! Excellent idea! If Brigid wins we could celebrate with a Guinness in one of her pint glasses! LM has been wonderful this year – thanks to the SEC and all the celebrity bloggers. I must go with Brigid, a saint I knew little about and was delighted to become better acquainted with. I think the world is better for having had both Francis and Brigid in it. Brother Francis’ turn. I’d like Bridget to seal it next time (if she can). I was hoping for St. Francis to win all along. Then this morning, my Celtic heart was moved to vote for Brigid. Francis already has much acclaim–let’s highlight another wonderful, but less known saint. A man won the Golden Halo last year, let’s give it to a woman this year. What really pushed me to Brigid was the beautiful quote and the “three Marys”. Those Marys stood at the foot of the cross on Good Friday. It is fitting to commorate that during Lent and Holy Week. Brigid for the Halo! My very Irish heart voted for Francis. I do not believe that anyone other than Francis has lived a “Jesus life”. I’ve walked the streets of Assisi and breathed the air and have forever been changed. I do want to thank everyone who participated in every way. Lent was made a holy pilgrimage for so many. With gratitude. Shouldn’t Brigid be honored with a stein instead of a mug? Put me down for a Brigid Beer Stein! Let’s vote people! If it were any other I’d vote for Francis, but I must vote for my namesake an unofficial patron Saint. I am going to miss Lenten Madness so much! Reading it and voting is such a great way to start the day!I voted for Francis (the rainbow bridge is crowded with those I have loved) but will be happy with either one as the winner. Yeah, I’m going to miss LM also. Why don’t we petition the SEC for Ordinary Time saints? Grins. Maybe the SEC would consider something for Advent?? Wonderful idea. Balthazar could have another go and Elizabeth and Gabriel and Zachariah and how about Simeon and Anna? Although the grilled cheese really does sound great, it’s without a doubt Francis for me. Even before I became Christian I knew of and admired him; he was deeply authentic and frequently did the most astonishing and gratifying things. Now I see that his deep love of and for Christ was the source of everything he said and did. Well, that’s an angle not previously mentioned! But it’s Brigid for me, anyway. A hard choice. Spent our honeymoon in Ireland, thought the beer was bitter and the milk and ice cream tasted like a cow smelled. Francis is an inspiration, but Brigid stood her ground, freed her mother, started an equal opportunity monastic order, was the first woman bishop, and Celtic wisdom, humor, literature and music are the best. So here’s to Brigid and her prayer . Raising my glass for Brigid! Hoping for a win for Brigid. Would enjoy a Brigid mug for certain! I am an admirer of Francis and even tho I voted against Brigid in all the other rounds I am going to throw my hat in the ring for the mirrored Abbess who gave away her fathers stuff and liked beer. Its been a good Lent in part because of the madness. Now can only hope Michigan State can beat Duke on Holy Saturday. NEVER going to happen! MSU has already lost by 10 to the DUKE team. Voted for Brigid because the prayer in this post reached me and I’ll be delighted if she wins. However, the prayer attributed to Francis is one of my “go to” prayers so if he wins, I’ll buy a mug and keep it on my desk to remind me to say it more often. I’m in a win-win! Thanks to the SEC, Celebrity Bloggers, the inspirational saints, and all of you commenters. I appreciate the thoughtfulness of your comments and the respectfulness. It has been a wonderful Lent Madness this year. This was a tough vote, I love both of these saints, but the young farmer in me voted for Francis, the patron saint of animals and ecology. Have a blessed Holy Week and Easter everyone! I agree Oliver, I voted for St Brigid too. As I’m looking out my window and watching the first robins of spring fly into my yard, I cast my vote for Francis. Thanks to the SEC for a memorable Lent Madness. It’s been a wonderful Lent Madness: thank you to everyone involved. It’s been great to be a part of it. I am inspired and encouraged by this wonderful array of saints. Today I am voting for Francis, for his radical call to the church and for bringing to the fore and celebrating our interdependence with the whole created order. Oh, the drama! I’m rooting for Brigid but you can’t lose with Francis, either. So encouraged to know your class was involved in LM. Trust you are planning on next year also. I think there were several other children voting and commenting and it is, as I’ve already said, very encouraging. Blessed Easter. Brigid’s prayer is lovely. And I do like grilled cheese and milk. I was going to vote for Francis but then I read Brigid’s quote and while both quotes spoke to me Brigid’s spoke just a little bit louder. This is my first year being a part of Lent Madness and I really appreciate all the hard work that has been put into this. Thank you. And thank you Oliver for your posts!! And if I may be so bold to add I so appreciate that this last day of Lent Madness happens to fall on my birthday. What a wonderful way for me to celebrate!!! Thanks and God bless. It seems a foregone conclusion that Francis will win, but I’m glad the margin is as close as 4% (at the time I voted). Both the closing quotes are marvelous, but I find it interesting that all Francis’s lines begin with “You are” (i.e., God is) all things things, and all Brigid’s begin with “I would like” all these things. Should have been “all *these* things,” of course. Lord, make me a better proofreader. Going with Brigid. Everyone knows St. FRancis, And considering fire from heaven shown down on her, I think we should recognize her in modern times. Can’t wait to order this year’s mug. Thanks to Oliver, your comments were wonderful! They are both more than worthy. Tough choice. However, I will never forget Thecla and her ravening seals. Apparently neither will I. I’ve tried. ’nuff said … and yes, Oliver does rock! I voted St Francis not only because his life is to emulated, but also I am an avid animal lover, and I had to put to sleep my beloved bailey, our bassett hound, this year. I have to vote for someone who treasured the lives that I do, the innocent and sweet natured animals that comfort us and are with us. I feel if I support francis, perhaps a part of my bailey-boy will be back with me for a little bit, and that is something worthwhile, to be treasured. Condolences. He will always be with as long as you remember him. And bless the beasts who bite, sting, snarl, smell bad, and poop in all the “wrong” places as well! Very sorry, Justin. Dogs are just the greatest, aren’t they? I enjoy all the celebrity bloggers comments but wonder if you could have a few more links to the saints writings. Just a thought. What fun this has been!! Thank you to Tim and Scott and everyone at Forward Movement for the (obvious) hard work that goes into making this informative, fun, and a bit of a spiritual journey:). Blessed Holy Week….continuing. Long ago, I chose Brigid as my personal saint, so she must have my vote. They are both worthy of the golden halo, though! The gift of being named for Brigid of Kildare provides me with a daily role model, and sometimes I need the modeling minute-to-minute. My father was particularly fond of this description that follows (I have it on a prayer card, but I don’t know the origin): “For this was her desire: to satisfy the poor, to expel every hardship, to spare every miserable man…She was single-hearted (towards God); she was compassionate towards the wretched, she was splendid in miracles and marvels; wherefore her name among created things is Dove among birds, Vine among trees, Sun among stars…she is the prophetess of Christ;….she is the Mary of Gael.” Not to slight Francis, but it seems this is Brigid’s moment. Yes, thanks – it’s very beautiful. And yes, I love the words about this being a community that takes their faith, but not themselves, seriously. May it ever be so! Though it was a difficult choice, I had to vote for St. Francis because my dog asked me to! Thank you celebrity bloggers, SEC, and voters. Wishing you all a Blessed Easter. This final choice clearly illustrates the absurdity of choosing between two saints. So, those other Irish women (of Notre Dame) are facing off against fur, feathers, and shells of the huskies, gamecocks and terrapins this Holy weekend. They need St. Brigid on their bench to overcome St. Francis and his creatures great and small. So, St. Brigid to take the Fighting Irish to their Golden Trophy. I would be dead today were it not for Francis’s intercession. So, well, what can I say? Heartfelt thanks and kudos to the SEC and the celebrity bloggers! You have enriched my Lenten journey, along with the good brothers at St. John the Evangelist monastery. I found out about them right here at Lent Madness. See you next year. He is risen! Thank you Lent Madness and SEC for another GREAT season! There were surprises along the way, as my poor bracket will attest, but I still have a shot at predicting the Golden Halo winner. Go Francis! I was going to go with Francis, but I had a last-minute conversion to Brigid. Either way, I’ll be happy with the golden halo winner! It will be close but I voted for Brigid. Congrats to the Bracket Comm for this years wonderful women. Voting for St Brigid today because the eternal flame she kept going until Henry VIII extinguished it has been reignited by her order. May that light burn in all our hearts daily. With thanks to Scott, Tim and each celebrity blogger for their gift of faith, history and fun. My second year of participating. What date do we start next year?? This morning, as soon as I was awake enough to be aware of anything, a beloved folk song from the 1960’s appeared on my personal “Muzak”–whose playlist I seldom have any choice about. (That’s the music playing in my brain.) How appropriate for either of today’s choices! Some just clap their hands, Oh! That one brings tears, for no good reason. Mango (the Senegal parrot who runs this house) and I are voting for St Francis, and would like to remind all that Francis too gave away a lot of his father’s stuff, much to his father’s dismay. Five weeks?!? 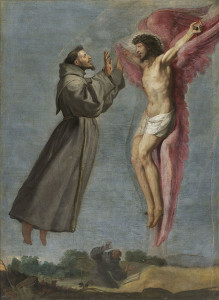 Some of us have been waiting for NINE MONTHS (interesting time frame) for Saint Francis of Assisi to stand for the Golden Halo. The Episcopal Youth Event (EYE) community voted him into this year’s Lent Madness bracket last JULY!!! GO FRANCIS!!!! Come on, team EYE! We can win this! WOO! “You are our enough…” I vote for Francis. Thank you all for another wonderful Lent Madness! I can’t even use my tiebreaking method for this one (choosing the one I’ve voted for most…I’ve had both Brigid and Francis from the very beginning.) What an excruciating choice. Time to take a peek at Oliver’s vote! Lisa Brown, your post above reminded me to thank church staff everywhere for the hard work that goes into Holy Week, planning everything so well that we in the pew can worship without distraction and emerge with the joy of our Risen Savior. Well done! Brigid. And may her mantle cover all of us. (I still love Francis, though). Thanks so much for this wonderful Lenten exercise. I’m for Brigid, because peace and cheerfulness are very important. I first heard of Lent Madness last year and was totally intrigued. But did not know how to participate. Then we moved to Dallas and Scott Gunn came to preach. We got the Saintly Scorecard and the rest is history! Every morning at 7:01 CDT my husband and I open the email from Lent Madness, read the Celebrity information, discuss our voting preferences. We are going to SO miss wonderful, exciting, joyful activity! It’s made Lent much more full and complete. Thanks, Tim and Scott! How much fun to be an Episcopalian! So very true! From another Sally with hugs…. This may be the toughest match-up yet. I’m girding my loins to vote…. Brigid, because “I would like the friends of Heaven to be gathered around us from all parts” means all of the loved ones, two and four legged, will be gathered there. It is a a two-fer, Brigid and Francis at the same time. A Brigid mug for me if she wins! Perhaps, if Francis wins, Brigid should be brought back next year or at least the year after. I, too, would like to see her win the golden halo. This is my first Lent Madness and I have thoroughly enjoyed it. Thanks to all, including the humorous and wise participants. I will miss this morning fun. And I’ve learned lots. I have intended to vote for Francis all along, but after reading Brigid’s prayer and some of the comments, I’ve decided to go with her, too. Easter blessings, all! So, it came down to the Italian v. the Irish in an Anglican contest. Thank you, SEC, celebrity bloggers, and everyone whose votes and comments have helped make LM such an enriching and fun experience! I voted for Frances, but I think I will be happy with either outcome. I, too, would like all those things. My first Lent Madness, and I’ve thoroughly enjoyed it. Thanks to all who make it possible, for the education and enlightenment, for the good humor. May everyone have a blessed Holy Week and a joyous Easter. As Gaeilge: Vóta do Naomh Bríd, an idéalach na hÉireann fáilteachais. Cad naomh iontach! Grámhar, a thabhairt, atruacha, agus cócaireacht maith agus bríbhéir beorach! Brigid! Yay, Oliver! Thanks for being involved with this–you lightened our hearts and gave us lots of reasons to vote…and today is no different. Grilled cheese sandwiches, indeed. SEC, Celeb Bloggers, Bracket Czar, you have done great work this year. Well done! Especially the videos … thanks very much for all the hard work. I love how the last day ends in prayers. Great choice! How could I vote against the impassioned plea to our clergy after our reaffirmation of ordination vows by our celebrity blogger. While my Irish heritage pushes me toward Brigid I must remember the teachings of Cuthbert Vs. Bede ( Oh Bede If you hadn’t been such a great author, sorry digressing over a busted bracket ) Sea Otters make one saintly and Francis is all about sea otters therefore there is only one choice. Saint Francis !!!!! Happy Easter to all !!!! This Lent Madness, and the community that’s developed because of it, has been such a joy. It’s been great to read people’s comments. Thank you SEC! Your work has fed my spirit and my mind! As for voting today, it had to be Lady Brigid. Especially after reading today’s prayer! I’ve always loved both of these saints, but felt moved to vote for her. I’ll buy a mug no matter who wins, and I agree that Pope Francis would get a kick out of a Francis mug. I bet he’ll like Lent Madness too! When visiting Ireland, land of some of my ancestors, the spiritual dimension of the land was a constant, palpable presence. Holy wells were not merely places of idle superstition, but places of devotion — thin places. And coffee mug, with milk of course, or beer stein — make mine a dark stout, either will do fine. Francis is not to be trifled with, stigamata and all. BUT Bridget is for today, and tomorrow. With others, I offer thanks to the SEC and bloggers. Job well done. Till next year. I want to thank the SEC and the writers for presenting us every Lent with a great cloud of witnesses whose lives inspire, enrich and inform us on our spiritual journeys. As important, thanks for the fun and the community! I’m about to have LMW! Let me add my thanks to everyone who contributed to Lent Madness, I too am already worrying about LMW. Today features two saints that I have voted for each time but I am a veterinarian and my final vote must go to Francis. If he wins perhaps I will have a beer in my Lent Madness mug in honor of Brigid. I attended St. Brigid grammar school in San Francisco many, many years ago. As much as I have always been touched by St. Francis, I would be grateful if Brigid became more well known. Deepest thanks and gratitude to everyone involved in this Lent Madness, and to all those who comments were so affable. Happy Easter, see you next year, God willing! Thank you SEC and Lent Madness–I voted today with tears in my eyes. The prayers are beautiful. As a member of St. Brigid of Kildare Episcopal Church I voted for Brigid! Go Brigid! However I cheered Francis all the way to the Golden Halo round too. What a pair to have to choose from. We can’t loose. Thank you Scott and Timfor this wonderfully informative and “fun” Lent. I’ve enjoyed every day of it! I voted for Francis today as I have since the first round. I have such a soft spot in my heart for animals and have to say thank you to Francis for bringing to light the care of all God’s creatures. Yikes! I don’t know who to vote for. Both have ample qualifications for the golden halo. I guess I’ll think of my cats, Fluellen & Ray, and vote for Francis. Then I’ll go out and have a beer for Brigid as well. Francis lost this once to Mary Magdalene. I love Brigid, but no way should Francis lose twice. Well, we can’t lose on this one — except that we need 2 halos this year!! This will be a close one. I love them both and such lovely quotes for each. St. Francis for the Golden Halo! I have so enjoyed this Lenten journey. See y’all next year. I love both saints and will be happy whichever one wins. In the end, though, I voted for Francis– not because (as one commenter put it recently) I am a sentimental woman with too many cats (well, only two, but they are Siamese…) but because Francis worked so hard to reform the institutional church. That makes for a less exciting story than, say, Brigid’s miraculous cloak or his stigmata, but having worked in a big bureaucracy for decades, I appreciate the work and dedication it takes to try and reform the entrenched ways and resistance to change of a powerful institution. Francis left a legacy in his personal example, in his teachings, and in the three orders he founded that, more than seven and a half centuries later, keeps calling Christian churches back to the basic teachings of the Gospel. Thanks to the SEC, the celebrity bloggers, the bracket czar, the resident foodie, and all the commentators for a wonderful Lent Madness. It’s been informative, inspiring, and lots of fun! Susan, I was referring to myself in the comment, though I was lying about the cats. I have enough cats, not too many. But like you, I admire St. Francis for much more than his factoids and objets de silliness. Peg, I loved your comment and have been smiling about it for days. With apologies to cat lovers, I’m with you on this, Robert! I’ve heard cats hiss, but never boo. Maybe a ghost cat would do that, though. I love St. Francis, but his presence here is like that of Daniel Day-Lewis at the Oscars — practically a foregone conclusion. I think a “new” kid deserves a shot at the halo. Ergo, my vote for St. B of Kildare…. Well Molly was certainly a “new kid” as were several others. Easter Sunday is my daughter’s birthday. This little Brigid will be 2. I can think of no better way to honor her namesake than by voting for a strong, fiery, and holy woman like Brigid of Kildare. I named her after Brigid for a reason! Yes!! My little Bridget is almost six… I loved telling her last night that her saint made it to the final round! Another wonderful Lent Madness. Many thanks to the SEC, the CBs, the behind-the-scenes people, and all the commenters. Is there any hope of a Like button next year? The prayer it was that convinced me. Dearly as I love Francis’s prayer of praise (which was beautifully set to music by John Michael Talbot), Brigid’s spoke of concern for other humans. Somehow we humans–and especially we Christians–need to find and preserve a balance between loving God and loving one’s fellow humans. We are all winners with Lent Madness! We have become a community where we have learned, laughed, and shared our spiritual journeys. Oliver, your comments were spot on and became a beacon for many. Today, it was a delight to hear about the fifth grade class using the saintly bracket as a learning tool. So, let’s add some more kitsch to the Lentorium — a doggie bowl for Francis and a beer mug for Brigid. I’ll be glad to buy one of each. As for me, I flipped a coin and voted for Francis. His prayer for peace has been a touchstone for me for many years. Peace and thanks to you all. I vote for Egeria. Molly? O. That was yesterday. Have to vote for Francis to finish him off, so nextyear’s competition will be more fair. Voting for Brigid. She beat out my favorite, Egeria, so I think she is worthy of The Golden Halo. My anglo-catholic cat Humphrey would have been okay with either saint, but my neo-pagan zen cat was very much hoping that St Francis would win. In any case, both of them are still waiting to find out if the patron saint of cats, Gertrude of Nivelles, will be in the bracket next year. It’s a real big thing for them. Here’s hopin’. My furries are not very religious — I’ve tried but if Gertrude’s there it might help. I have suggested Gertrude of Nivelles several times . . . as have my cats – hope the SEC is listening or at least reading these comments! Best comment of the 2015 season…. My cat Wesley keeps bragging that his saint already won. Laurie Brock, for giving us the opportunity to study the adored St. Francis of Assisi. You and St. Francis always won my vote. Nancy Frausto, for describing so well the beautiful witness of Juan Diego, as well as the incredible courage of Bernard Mizeki. David Creech, for taking us on wonderful adventures with Brendan the Navigator, as well as Elizabeth who entered motherhood unexpectedly late, and Margaret of Antioch who defeated a dragon. Maria Kane, for your just portrayal of Molly Brant, a woman who overcame enormous injustice, and for your championing of Frederick Douglass, who championed equal rights for all. Neva Rae Fox, for insightfully presenting David Oakerhater and Kamehameha, who illustrate the fact that the most humble military prisoner can rise to serve God and humanity just as well as a king can. Amber Belldene, for enchanting us with the grace, daring, and faithfulness of Irene the Great, princess of peace. Laura Darling, for energetically introducing the indefatigable Jackson Kemper, pioneer church builder. David Sibley, for diving into the history of Thecla with as much passion as Thecla diving into a pool of seals. Robert Hendrickson, for guiding us through the stories of Thomas Ken, who knew exactly where he stood, and Dionysius the Great, who took a stand for prodigal Christians. 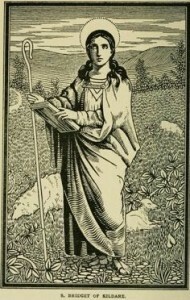 Megan Castellan, for your superstar write-ups of two of the superstars of this Lent Madness: Brigid of Kildare, the first woman bishop, and Egeria, who preserved, through her own writing, the first Christian traditions. SEC and the Bracket Czar, for running Lent Madness smoothly, and for challenging participants to grow in our faith. Comments like yours are why we need a Like button. Why can’t you simply say you agree or it’s a great comment or you like the comment? If we wanted Facebook we’d be doing Facebook. I totally agree – we need a like button ! I agree; many thanks to the SEC, and to the bloggers, and to everybody else involved. Great job. I agree we really need a like button. Kim on the Bayou… thank you for the attention you paid. Well said! My second “like” of the day. Thank you for your thoughtful reflections and for posting them. I like the affirmative mood of Francis more than Brigid’s subjunctive mood . Francis and Brigid are saintly. The halo fits each like a glove. But either one is not wrong. P.S. Thanks to the SEC, the bloggers, and the cloud of Lent Madness witnesses commenting, praying, and making a wonderful journey together. What joy to be part of this. Like the poem! So true. But today I will keep calm and Brigit on!-(As was said by Barbara and Christie in a previous discussion.) I also like grilled cheese and a glass of milk. Thank you Megan and Laurie for those beautiful prayers. On Sunday, I predicted that it would be Francis vs. Bridid; I’ve voted with the loser so many times this Lent that I started to see it as a game. I thought when I opened this this morning that I would vote for Francis, because nothing about Brigid has touched me. But “an abundance of peace” and “cheerfulness” presiding over us changed my mind. A warm word of appreciation to the Supreme Executive Council and the members of the Lent Madness community. I’ve enjoyed it immensely as, well, a Lenten pleasure! A lurker no longer, I look forward to next year’s event. GO TEAM BRIGID OF KILDARE! IF YOU DON’T VOTE THE GOLDEN HALO WILL NOT BE FOUND ABOVE HER HEAD. My first Lent Maddness. What I thought would just be a fun game, actually turned into a profound daily meditation for me as I reflected on the lives of those saints. They have inspired me to try harder to be a Christian witness through my actions, and to love more deeply, widely, and unconditionally. Thanks, SEC. I’ll see you next year. Voted for Francis, but would love Brigid to win. Talk about dual minded! Thank you for this wonderful journey. This was my first LM but it certainly won’t be my last. This madness has been hilarious and fun and it also has been a healing process for me this lent. God bless you all!!! Oh dear, it’s frightfully close. Go Brigid! Thanks, celebrity bloggers. You guys rock. Oliver’s comment swayed me, but not in the way you’d think. I realized that I was hoping he’d voted for Francis. So Francis it is! Francis is well known, inspirational and revered. But Brigid is a fresher face to many and a true saintly role model for us today — an activist as well as a contemplative, with open arms and loving hospitality for all, inviting all of heaven and earth to her hearth side. Vote Brigid! St. Frances & I share a name & I love him & have him in my garden caring for the azalea bushes, but St. Brigid is very special to me, too. Her abilities & those who recognized them in her lifetime & since make her as a woman of faith very hallowed. I serve on the board of Brigid’s Place at Christ Church Cathedral in Houston, TX, where this Holy Saturday at 4:00 we will present a dramatic reading/musical tribute to the women who stayed through Jesus’ crucifixion, death, & resurrection. It’s a powerful dramatic reminder of how important the women have been since the beginning. Come if you can and/or make a contribution to our ministry. I have already voted, and then lost the page. I have thoroughly enjoyed Lent Madness, and learning about so many saints. I am a laywoman and therefore recognised only about half of them. Interesting and fun. Thank you all. P.S. Where was the recipe page, and is there really going to be a St Francis mug? One of the points that led me to vote for Francis was the power of his legacy through the Franciscan order (both its Roman Catholic and Episcopalian branches) and all the good work they continue to do. And thank you to all for your companionship this Lent. This is a tough one. I love them both, but have to be loyal to Brigid! I do think that the only thing missing is a rendition of One Shining Moment from the Supreme Executive Committee! I felt doomed casting my vote today, and sure enough, once again have landed on the losing side. Now my first souvenir mug is going to be one for whom there have to be a jillion souvenir mugs with this saint’s mug on the mug. Oh well, I cherish my Queen Victoria cup, sold during her 1897 Diamond Jubilee festivities, found inexpensive on eBay. Your mug will be divine and I will be proud to line up with thousands of fans to buy one. Many thanks for Lent Madness. I have had such a good time. Spiritual in important ways, connective for starters. My birthday is February 1st so how can I not vote for Brigid. The Stigmata legend does bother me. How did Francis claim he received the marks of Christ? I was very pleased to see that 3 of the final 4 are women. I will vote for Brigid, based purely on my idea of what each might do with a golden halo. I think Francis would give it away, or in the case of the Lent Madness golden halo, play fetch with a dog. I am guessing Brigid would probably sell it to buy cows for the poorest of the poor around her thus enabling them to make a modest living, much on the order of Heifer and ERD. Simply because she is a woman, Brigid would find a way to enrich the lives of many, and encourage them to pass it on to others. In this way, many of the poorest folk on earth would not only come to Christ, but also to be witnesses to the wider world around them. Thank you all, celebrity bloggers and SEC for an enlightening Lent, and blessings for a meaningful Easter. Another final round with all the frustrations and lots of wonderful role models for us to ponder about. On the final vote, I have to go with Brigid, wonderful story and we enjoy beer. Horrifically tough choice. I admire Francis for his dedication to a humble life, and Brigid for her version of a monastic life that said women could work for The Lord alongside men. The Celtic branch of Christianity had married priests and coed monasteries. The Roman church should have kept that custom. So, here’s my vote for Brigid. May one day there be again women priests and bishops, in the Roman Catholic Church, as in the past. Hear, hear! The Church dropped the ball on allowing married and women priests. I, too, hope that can be rectified. And I’ve always been closer to the Celtic Church approach, in general. Brigid. I have been lobbying for her. It’s close, now. Just think on this: Francis, in all his humility, gets a lot of attention. Let’s vote for this almost modern woman, and he’ll likely approve. I baked a round of St. Brigid Oatcakes this morning (saw the recipe posted here, thanks!) and was hoping for a St. Brigid mug to accompany my future oatcake breakfasts. At this point, it looks as tho I will be drinking my tea with St. Francis. And that would be equally delightful. While I do love Francis, I must cast my vote for Brigid to honor my VTS class mate David whose daughter is named Brigid. St. Francis: joyous, inclusive, mystic, practical, unselfish, unafraid, peaceful, holy. My choice from the beginning of Lent Madness. Thanks to everyone who made this year’s contests so exciting and informative. Looking forward already to next year! I wish to bid you all farewell here on this last day of Lent Madness. I have been a “lurker” throughout this Chaucerian ride together to “Canterbury.” But I have gotten up early every day and read the official commentaries and made my vote and then checked the blog threads throughout the day to ponder the replies. My brackets were busted early on. I voted for Hadewijch for the Golden Halo. (I have to say, I felt that we were playing a Quidditch series in Harry Potter.) I simply went through and mindfully chose the saint who I thought most spoke to me, and I was WAY out of the mainstream throughout this “contest.” I was very interested in the Beguines and medieval women’s mysticism, and I found myself weeping for Jan Hus, who wasn’t even in this year’s contest. At first I found myself offended by some of the reasons people voted and I was dismayed by some of the more cantankerous or ornery posters. But I considered that some of my reasons for voting might at bottom provide an obstacle to another person. And I reflected that we were all “posting” together toward “Canterbury.” (I suggest Chaucer be included in a future LM.) And all we pilgrims were in this together, even the ones I liked less than other ones. I found that my reasons for voting changed as we went along. I found my little grudging heart opening just a tiny bit as I tried to incorporate the views of others into my reasoning. In the end I voted for Brigid for the quidditch cup (I mean Golden Halo) because I was so moved by the Celtic goddess aspect and the effort to merge pagan and Christian spiritualities. I have been profoundly influenced by the notion that there is a broad spectrum of spiritual practices and that we should make an effort to affirm them. My absolute favorite moment was in the kitsch round: the idea that a goldfish too is on a pilgrimage with every trip around its bowl, because it cannot remember more than thirty seconds’ worth of stuff. That made me laugh my donkey off. The “Got Thekla?” mug is a close second. I want that mug way more than the Francis cup which it is now looking as though I have pre-ordered. However, I will cherish it as a memory of this experience (and possibly invest in a glow-in-the-dark Jesus figurine for my dashboard). My prayers include all of you who have shared this Lenten journey with me. I appreciate all of your wisdom and your struggles to articulate how you have been touched by these figures in Christian history. I know I am not the same person who embarked on this journey at the beginning of Lent. Thank you all for helping me grow in spiritual maturity. I am a member of St. Michael and All Angels in Portland, OR. I wish you joy at Easter. See you next year. Very close to my own experience/thoughts! See you next year! Wow, what a debut into the commentaries! I am quite touched by it and hope I wasn’t ornery or cantankerous. (I do remember getting very worked up about Hadewich, Dorcas, Margaret of Antioch, Elizabeth, Thecla….) I look forward to our pilgrim journey next year. Thank you telling us about your journey–we are all in this together and will see you all next year on the road to Canterbury. Several folks have mentioned this community that has been formed. I’d not thought of that before but now it seems just right. It’s been a community of faith and I hope to renew acquaintances again next Lent unless we can prevail on the SEC to leap into Advent. I’d promised myself that I was going to be quiet from now on but then — Let’s Lobby! Would it be another saintly smack down, or something new and different? We have to come up with a good premise. Oh, there are enough saintly folk to smack down, I think. Unless the SEC come up with another grand and glorious fantastically mesmerizing and educationally funnily challenging gambit. I struggle with how folks vote as well, but I am convicted by your comments, I tell myself each year, that this is just ridiculous, and I won’t come back, but then I do. I suppose in the end, I need to keep the real purpose of this in mind, but is sometimes difficult. I have struggles with people using their own biases/prejudices, and perceived issues, using the saint’s as a way to fix wrong’s of the past. Or simply voting on the basis of gender, or beer, or kitsch. I don’t know I think I would be more in favor of this as not a competition, but a daily introduction, and then a summary at the end. I think the “competition” brings out the bad parts in our human character, or at least mine. Apologies to anyone, I was short with during LM, I will pray on that this evening. Peace. Well there ya go, Justin. And peace to you too. “Or simply voting on the basis of gender, or beer, or kitsch.” I’ve struggled with the same things you bring up, Justin. It does seem that, sometimes, people vote for personal things and not the saint. I do espouse my Irish heritage a lot, but I try to vote for the saint (Brendan and Brigid have been in my heart for a long, long time, though!). I’ve been able to be not quite so bothered by these things, and am content to believe I’ve voted for who I think should move on. Love learning about them all! Don’t forget the “madness” part of this. TotallySeriousLentenSaints.org is a whole different ballgame! HaHa! Is that a real thing? If not, it should be! But those “personal things” you mention, might they not be the very things that the voter is being challenged to work on in his or her life? The particular saint, strikes a chord and because of that resonance, maybe then growth and more self understanding might happen. I understand the struggle you have acknowledged, me too, but recently I’ve been thinking that I need to be less judgmental and self assured and just let folks be folks on their own terms. I dunno. You’re quite right, but you can know something in your mind but feel something else. I agree saints, social causes, even sports teams, etc., are close to a person because they strike a chord in them somewhere and that’s usually based on past experience. It’s something I’ve been working on, for me, that’s all. There is sometimes such a disconnect between the head and the heart. Isn’t Paul supposed to have said something about that? oughta be a tie but since I worked in the Committee to Save St Brigid’s Church in Manhattan, Ill vote for Brid who pictured heaven as having a lake of beer! I think so, too! Unfortunately, I’ve been tracking the voting off and on today and she’s been staying about 250 votes behind all day. Maybe the Irish will vote after work! Whew–I didn’t realize it would be this close! I thought I was voting for the underdog, but Bridgit is holding her own–I guess beer drinkers have united and done some heavy lobbying! Its been a wonderful time of learning and laughing and I have cherished every bit of kitsch! Who knew that St. Swithin actually existed! Who would have believed that one of my favorite early Christian writers, Egeria ,would make such a splash. And then there was the goldfish making a pilgrimage around his bowl. Many cheers for all the CBs and especially for the SEC who has given us this wonderful opportunity to learn and love so many followers of our Lord over the centuries. May we continue to cherish them all in our hearts as we celebrate a joyous Easter! Where was this goldfish talked about? I missed that! i think in the kitsch round. there was a picture of the little fish with a 30 second memory! Thanks to all who made this possible. Bridgid supporters do not give up hope! My former Irish father-in-law once explained to me how he used to cast votes for many of his ancestors laying in the parish grounds. I expect the Irish precincts will be coming in soon! Thank you, SEC! Another great LentMadness! LMW is starting early. Go Francis! I voted for bridgid because she reminds me of my church which is St. John’s the evangelicals Hingham. Hi William! Welcome to Lent Madness! See you next year? Throughout Lent Madness I have encouraged all employees at Saint Francis Community Services (based in Salina, KS) to participate in Lent Madness and encouraged them to vote for our patron saint. Today, I’ve asked that we pull out all the stops! Come on St. Francis. Francis vanquished my personal favorite (Thecla). Then Brigid beat out my next personal favorite (Egeria). So, this was a tough choice. I do love my cat; however we are raising her as a good Jew in deference to her other mother, so we’ve never been to a blessing of the animals (and she will celebrate her Cat Mitzvah this year). In the end, I went with Brigid. I do hope the SEC will bring back Thecla and Egeria in future Lent Madness competitions. Ravenous seals and attention to liturgical detail not to mention the need to recognize the oft-overlooked contributions of women to the development of the early church is worthy of honor, praise…and Golden Halos. Thanks bloggers! Thanks SEC! Looking forward to this saintly smackdown next year! so, your cat is 13? i would think st. francis, but Brigid is good, also. right now they are sooooo close. could there be a tie? i like that you’re raising your cat jewish. the cat mitzvah, does she celebrate Hanukkah, etc? her own menorah perhaps. if you get a boy cat you can buy him a tiny yarmulka-yep-try making him wear that! but let the doc do the bris!!! O yes, we’ve had Jewish cats, and still have a Wiccan cat – and we all celebrate Halloween out of respect for her former mother. And then there are our Christian cats – including Francis, Francine, and Brigit. After much discussion we voted (once!) for Brigid. the miracle of the Hanukkah turkey has a nice ring to it…..could be a book title! I want to echo the thoughts of Lucia. Might you be voting for St. Lucia one of these days? If so, I’ll commit my vote, too. We visited the island once upon a time and found it enchanting. Travel is on my mind. We go soon to Rome, to stay in Casa Santa Brigida while there. The hospitality of the Sisters is warm and caring. And the Vatican is a short walk away, and Pope Francis nearby. And Assisi just a drive through the countryside. St. Brigid is a most deserving contender, but the love of St. Francis for the earth and all its creatures, and his purity of spirit, his love of Christ, his humble sense of self, while uplifting others, is what I focus upon in this final moment of Lent Madness Golden Halo voting. I think it’s St. Francis’s turn. Won’t you please join me in making him this year’s winner. Much gratitude to the SEC and all of you. See you next year. Happy Easter! Interesting…I voted -against- both these saints in the Round of 32 and the Saintly Sixteen, then voted -for- both in the Elate Eight and Faithful Four. A difficult choice. After meditating long & hard, I finally went with Francis but am glad to see it’s as close as it is. Let me join my brothers & sisters in many of the comments above in thanking the SEC for another successful edition of LM. I especially appreciate your persistence in pointing us toward the risen Christ as the ultimate goal of our exercises here. Amen, and may God bless you for your faithful witness. This is my second time participating in LM and I intend to be back every Lent that I have internet access. See you next year, Lord willing! As a half-Irish biologist, what am I to do? Well, beyond the wonderful presentations by Laurie and Megan, I came into LM heavily under the influence of that Franciscan, Fr. Richard Rohr, who has taken me “Beyond the Birdbath” into the heart of Franciscan spirituality through his Daily Meditations which come in my email, through his books and other teaching materials (www.cac.org). As a cradle RC who has discovered that in my heart and soul I had been an Episcopalian for the last 30 years sitting in the RC church. I didn’t know it until I set out to find something more scriptually correct than the “new translation” of the Mass. I had been saying for years that the RC church can’t provide the pastoral care to it’s people with only celibate, male priests. That they needed married priests and women priests. I found what I knew was the Way that is now blessing my life in the Episcopal Church with Apostolic succession, the Blessed Sacrament, a reasonable translation of the Mass, married and women clergy and parishoners who take active roles in the operation of their parish (not having Father do everything). St. Francis spoke reform to the institutional status quo of the Church in his time. May we follow him in speaking reform into that same church, today. St. Francis spoke grace to all and helped the disabled and poor; he didn’t burden them with guilt and shame. My vote for St. Francis today is for my belief in the reform of the church today. Looking forward to the whole Triduum celebration. Blessed Triduum to everyone, everywhere! And to you! The web site is wonderful. Thank you. Peace. The San Damiano Retreat Center here in town would probably offer spiritual direction to anyone still indecisive about who to vote for. Just now voted at almost 4pm MST. Brigid is trailing by 34 votes! Wow, what a great final four, and conclusion to a wonderful Lenten exercise. How about some halos for thSEC and the celebrity bloggers? Francis has been special to me ever since senior year in college when I spent many hours writing my honors thesis on the cultural context of Lady Poverty to whom he was so Devoted. My cat Oliver attended the blessing of the Animals at St Johns Cathedral in Denver and sat through it with regal aplomb. But Brigid got my heart from the first round. My dad’s Irish family’s history has been the most difficult to trace and I only discovered my great grandmother Bridget O’Brien some twenty years ago. Since there are no family pictures of her I am going to put this lovely picture of Brigid and her crozier into my family album. I voted for her but am very happy with whomever wins. What a wonderful journey this has been. Thank you the SEC and the talented celebrity bloggers, and to all of you who have enhanced the journey with your insightful, humorous, witty and spiritual comments. As always, you have made it a great ride and I’ve on again found my Lent enriched with this fun practice. I know we all will miss Lent Madness and it might be fun to do something in Advent. I just think it needs to be different, saving the madness for Lent or it won’t be so special. Don’t forget you can join in on 50 Days of Fabulous beginning with Easter! As far as the vote, GO BRIGID. You’re about to cause an upset. Go Brigid! Go Brigid! Go Brigid! This is such a cliff-hanger!!!!!! I was going to vote for Francis all along, I named my son after him…..but Brigid got to me, especially with her prayer.. I haven’t participated in too many of these – has any saint ever made a comeback of over 250 votes when trailing by that much in the early-to-mid-afternoon? She was down about that much around 1:15 pm Central time when I checked. One year, the “Pineapple express” moved Queen Emma dramatically forward, but she did not prevail. Another time, the State Dept. rallied hugely for Frances Perkins, who did win the Golden Halo. Frances was a nice person who did good work in helping FDR establish soc. sec. Even so, some LMers began to think the State Dept. might just be a tad too large. Not to suggest cheating in that campaign. However, the vote count was very high in that particular match-up which did suggest a group joined LM just to promote one saint. Of course, that’s not against the SEC rules. If there were such a group, each member of the group would have missed out on a lot of saintly smack downs and a lot of fun. Of course, we all know Lent Madness Is madness. Perhaps. Wow! I just checked in on the voting and saw St Francis ahead by just ten votes! What if there is a tie? Would the water in the birdbaths turn to beer? Ha Ha! GREAT one, Suzanne! Please see the note at the end of the write-up, just before the poll/results. The SEC found cheaters — people who were voting as many as 121 times for Brigid. These people have been blocked, and their votes have been removed. There are some additional votes we are watching carefully. Our hope is that everyone gets one vote. To get your saint to win, encourage others to vote. Don’t vote lots of times! Cheaters?? Grrrrrr!!! C’mon, folks! Just encourage your friends to vote. Pagans and beer drinkers might help Brigid lap Francis for real. Exactly. Makes me sad – even if they were unaware of the rule (! ), it’s kind of common sense that you can and, more importantly, SHOULD only vote once. I must say that throughout this year’s Lent Madness I’ve been troubled by the many comments that suggest the “sisterhood” has been voting as a bloc. To the extent any man can, I think I get it about the subjugation of women and, in this instance, its effect on the number of recognized saints. I was very happy to see three women in the Final Four, notwithstanding the possible effect of bloc voting on that outcome. But today we’ve witnessed flagrant multiple voting (and I don’t think the perpetrators were necessarily Irish) and a commentator who states that she voted for Brigid because a man won the GH last year. Please, dear sisters and brothers, let’s recover the truth that in Christ there is no male or female, and next year let’s not divide Lent Madness into gender parties. It really does spoil the fun. I fear I will offend people with these words, and for that I ask forgiveness, but I just couldn’t keep them back. That someone would vote against Francis of Assisi, of all people, because he was male is Just too much. That he would have made a lousy grilled cheese sandwich is a much better reason, and much more in keeping with what this is about. As a woman, I completely agree with your words, Davis. I haven’t once voted on basis of gender and really see no reason to do that. Both women and men have pointed the way for us and, while there have been issues with women’s voices being silenced across the years, I don’t think “over-correction” is the answer. I voted for Brigid here because of her prayer, although I won’t be unhappy if Francis wins the Golden Halo. Frankly, though, off the top of my head I have no idea if I voted for more men or more women, nor do I care. I thank you for your post. Correlation is not the same as causation. Some days I may have voted for the male Saint, some days the female. At this point, I really don’t remember who received my votes 🙂 I approached each day’s vote as a new blank slate. If one day my vote was based on anything, the next day that same reason could become the reason I didn’t give a vote. It’s simply madness! Among the various reasons that could have affected my decision process, I think the only consistent thought I used each day was, which Saint do I want to give a chance to move forward. All else is a swirling madness .. and I’ve enjoyed every minute for learning/thinking about/considering/wondering what from this Lent Madness will inform my life. That the multi-vote problem surfaces prompts me to grieve for LM. But the overall vote numbers, over 7,000 as of 6:50 CDT, prompts gladness! Hooray for Lent Madness! Charlie, go back to the bracket and read the previous writeups about Bridgid. Yeah, I was a little confused by that, too. I was assuming it was because she’s the patron saint of milk maids and things, and supposedly could make butter, bacon and milk multiply, but am not sure what he meant. i could be wrong and i am not going back to the bracket right now, but it seems in the saintly kitsch round there was a toast imprinter thing with st. brigid on it???? hence the grilled cheese…. i am totally wrong. no toast imprinter in her kitsch. so OLIVER, do tell where you got the idea that Brigid makes a great grilled cheese sandwich…. Why? What evil hath he done? The real sin in casting multiple votes isn’t in breaking the rules to get your saint on top – it’s in what you do to all of that saint’s fans. Imagine all of Brigid’s supporters today, inwardly (or outwardly) cheering as their favorite saint rallied. Despite being behind all morning, she might just be able to do it! Only twenty votes away! But then you refresh your browser to check the score again. The post is just a little longer. (After checking the results so many times you really start to notice these things.) There’s a note from the SEC. What was an increasingly narrow gap suddenly looks a little more insurmountable. Your heart drops. So much for that come-from-behind rally. That’s the real sin in cheating: all the dashed hopes of the honest people who thought those votes were real. Corey, thank you. At one point they were only four votes apart and I was really excited that Brigid might win the Golden Halo, but that even if she didn’t it was going to be neck-and-neck right down to the wire. I really was downcast when I saw the change, and very disappointed when I read why. Sad. Does this mean the voting is tainted? Phil, just above the vote tally is an update by the SEC explaining what happened. St. Brigid… for her devotion to the poor, ability to multiply butter and bacon, as well as her simple and lovely words invoking the communion of saints. Not hating on Francis though because he’s pretty cool too. I encourage everyone to vote for Brigid- Francis has enough recognition, and she’s a real saint herself. It is so sad to see that people are voting more than once. Please don’t botch this! It only makes things harder for Scott and Tim. I’ve commented a whole lot but only voted once! As one of the youth from the Episcopal Youth Event who helped to vote St. Francis onto the bracket in the first place, I have been with him the whole way and that is where my vote is going today. I wonder if Francis is suffering from being so familiar. Isn’t that a testimony to his universal relevance? I cast my halo hopes his way. And certainly, the SEC should give TSSF (Third Order Society of St. Francis) a group discount rate on mugs! Support our Anglican lay religious! I planned to vote Francis but couldn’t decide. After taking all day and not knowing how close it is I voted for Brigid. What if they do tie after all? we are all richer for knowing the prayers. Thank you SEC. I look forward to getting the new mug no matter whose likeness it proclaims. Had to go with Brigid to of Kildare, though I also love Francis of Assisi, but Celtic Irish wins out any day for me… Plus she is a woman, and I am from an old Irish family. Both so very saintly, I had to ponder a bit on them, prayerfully. I had a conversation with my dogs . Then I remembered how after a little prayer to St Francis calmed my grand daughters when one of the dogs went missing. Shortly after Tanner was home. Well may we say the Pope and her husband. Go Francesco! I also want to add my thanks to everyone who researched their saints, and wrote such thought-provoking stories and commentaries. A blessed Easter to all! Oliver is wrong Francis will win and I don’t think that Brigid would make a good grilled cheese sandwich and perfect milk and this KAM guy voted for Brigid but that Charlie guy was right and after Juan Diego lost I wanted Francis to win the #Golden Halo. The Circle of Days, based on St. Francis’ Canticle of the Sun, was always my children’s favorite bedtime storybook, and even as surly teenagers, they still occasionally recite the lines. It has always been St. Francis. Brigid is my gal, but as a Franciscan, it is a hard decision.